One of the most confusing, agonizing and expensive times we can go through is when we or a loved need long term care. It can be an extremely frustrating time just trying to gather information. What kind of care is best? How expensive is it going to be? Why doesn’t Medicare pay for this? Do we really have to go broke just to get Medicaid to help to pay for this? Where can I get help? Knowing this information can help you ask smarter questions and help you find the right professional to work with. Care Assistance Planning in North Carolina can be filled with misconceptions, pitfalls, and traps, but there is hope and there is help. 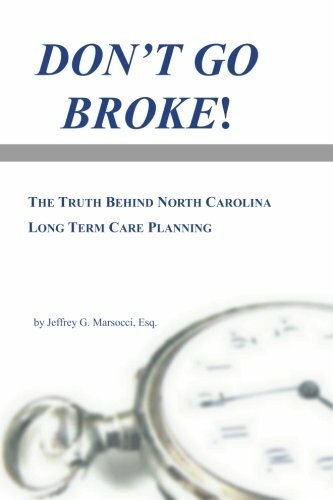 This book can help you recognize the biggest myths around Care Assistance Planning, review care options, understand the different ways to pay for long term care, and discern fact from fiction when it comes to Medicaid rules in particular. But one thing is certain... you don't have to go broke and bankrupt your family in North Carolina to get the long term care help you need. Jeffrey G. Marsocci is an author, Care Assistance Planner, and attorney who has helped clients and their families for more than fifteen years. He has successfully helped hundreds of clients and their families plan for the future while avoiding hidden tax traps, loss of benefits, and burdensome red tape. Mr. Marsocci frequently leads seminars for clients as well as continuing education courses for financial professionals and attorneys.